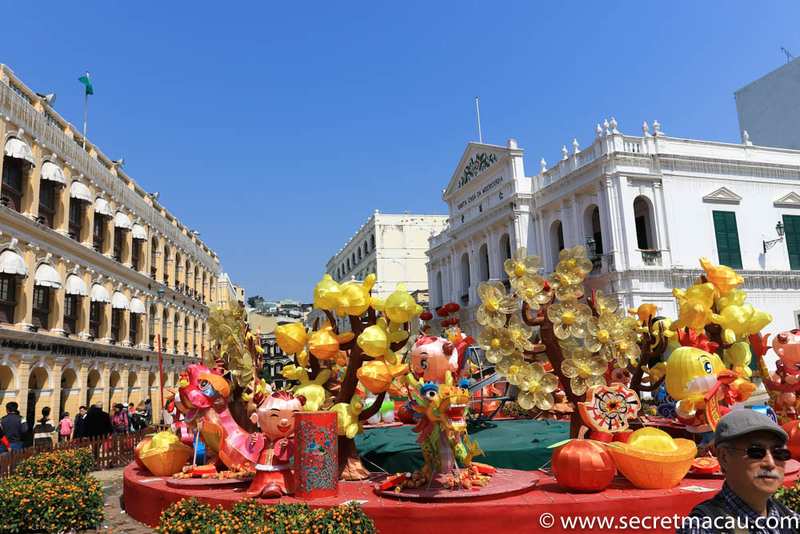 Macau is a wonderfully vibrant and bustling city all year round. 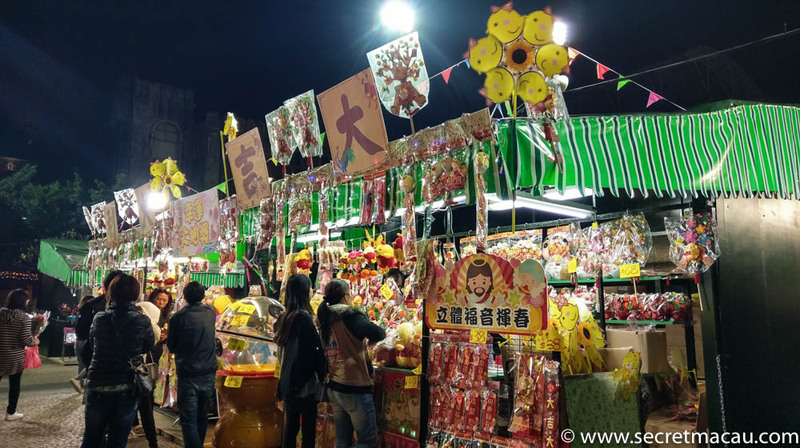 Volumes of visitors rise and fall over the course of the year in line with festivals and events, such as the Grand Prix and Mid Autumn festival. 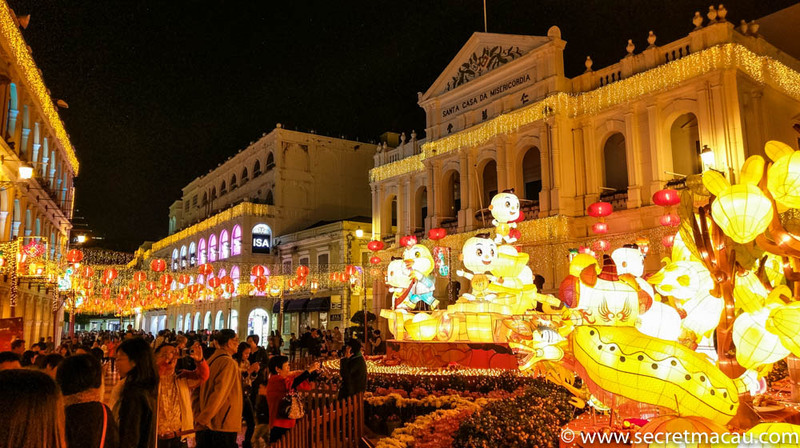 However, during Chinese New Year in Macau everything goes supernova – lights and lanterns adorn the streets, firecrackers echo through the night and hordes of visitors from the mainland (and beyond) descend en masse onto the streets and casinos. This is a great time to visit Macau and take in the sights, sounds, smells and tastes of the biggest festival in the Chinese calendar. It’s definitely worth visiting at this time of the year, but it’s worth being prepared for the extra volume of visitors (and potentially, the cold if you’ve never visited the region in the winter before). 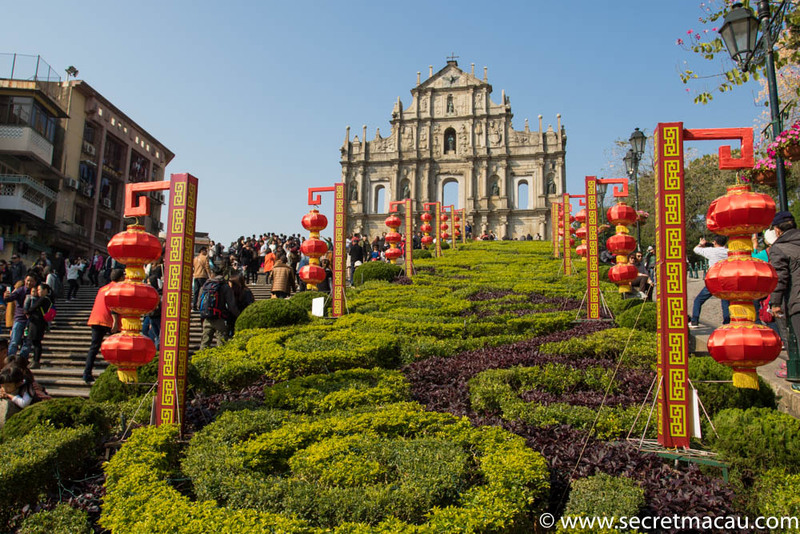 I hope to give you a few tips to help navigate your way around Macau during this particularly busy period. 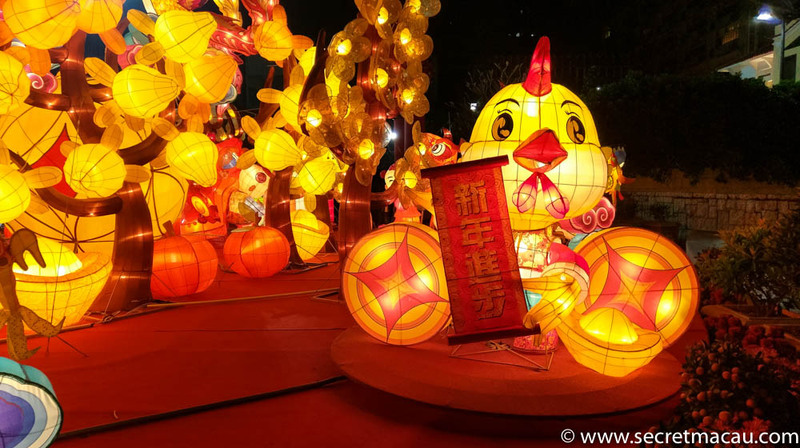 The Lunar New Year is the biggest festival in the Chinese calendar. Celebrations go on for a couple of weeks, running from New Years Eve to the Lantern Festival on the 15th day of the New Year. On New Years Eve – people typically spend with their family, having a family meal and giving out red pockets (these are small red/gold envelopes containing money). The real public activities start on New Years day. In 2018, New Years day falls on Friday 16th February. The Friday and Monday are public holidays (and the schools are off for around 10 days over the period). As you might imagine – that weekend gets very busy at the main tourist attractions. Check out my guide below for some tips on how to make it as painless as possible. This is a market at Tap Seac Square (the largest open square in Macau), selling flowers, toys and a variety of traditional New Year gifts. 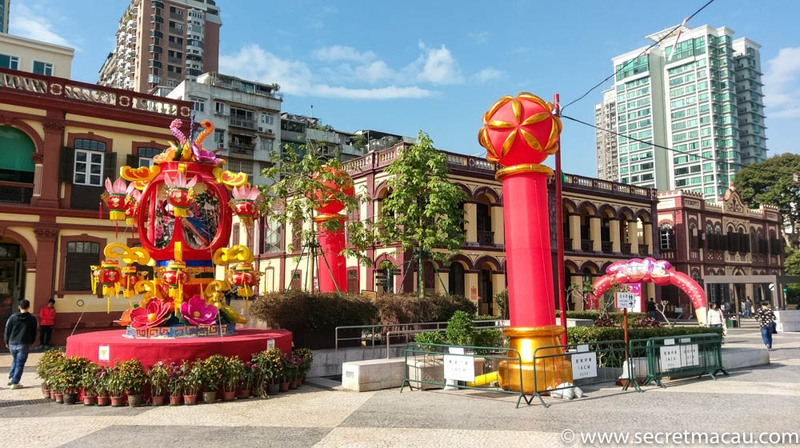 The market is open all through Chinese New Year, and Tap Seac Square is a great place to explore the St Lawrence and Costa areas of Macau. There is loads more stuff going on, especially during the New Year weekend itself. Check out this Macao Tourism webpage for a full list of things to see in 2018. Getting caught in the crowds is unavoidable, and is all part of the fun. However, if your time is limited and you have a full itinerary, it’s worth planning your day to try and get to any popular sites you really want to see when it’s not so busy. Mornings are the best bet if you want quieter tourists sites and transport. Visiting the very popular sites like the Ruins of St Paul’s later in the day will be more time consuming that first thing in the morning. More important than the just navigating the crowds, is thinking about transport. As the tourist sites get more busy, so the transport options get more congested. If you can get the bus to Coloane in the morning, you’re going to have an easier trip than later in the day (especially if the weather’s fine). Again – being in the crush is sometimes part of the experience – just remember to factor that in if you’re on a tight schedule. Public transport can get really busy at this time of year. Macau really isn’t very big – and a lot of places can be walked easily on the peninsula (just don’t try and walk from Macau to Taipa or Coloane). It’s worth keeping a street map handy – free from a lot of places (or better still, get a SIM if possible so you can use your smartphone). If you get stuck with public transport – have a check to see if you can walk it. For example – A-Ma Temple to Senado Square is quite walkable, and can take in some interesting sights on the way (A-Ma Temple to the ferry terminal though, for example, is less so). Buses are the best way to get around Macau, especially if you are there a few days and pick up the Macau Pass travel card. 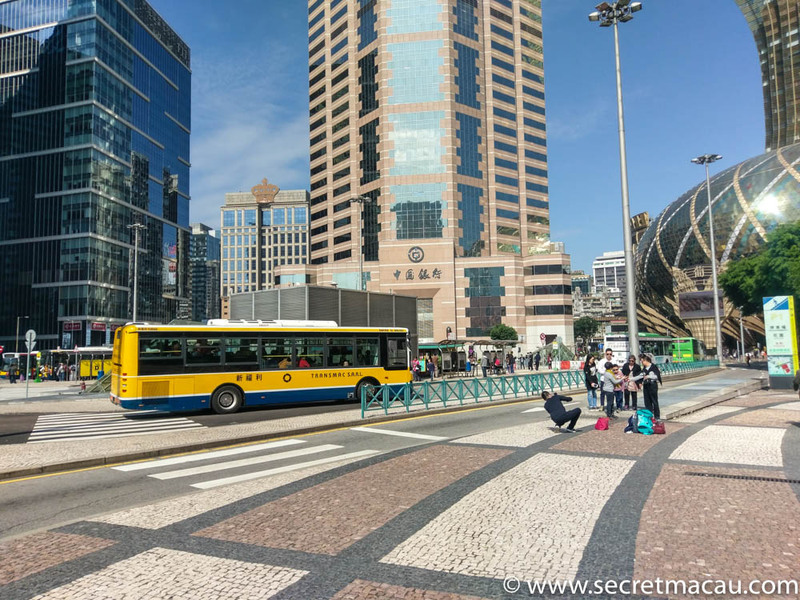 You can find more general details on using the buses in Macau here. 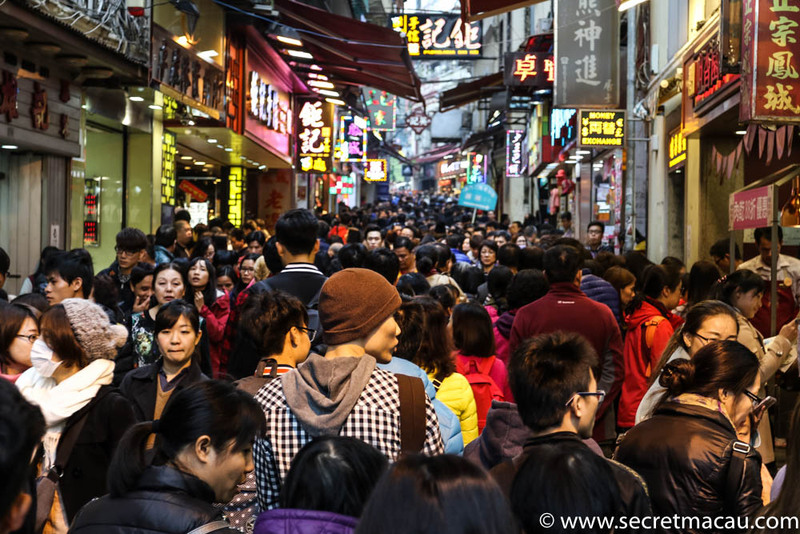 And remember – don’t be a pushover – standard advice really when in a crowded situation with a mass of mainlanders – don’t give an inch (and expect none to be given). The free casino shuttles are still a great way to get around – just be prepared for longer queues than usual at the bus stops. This is especially true at the big casino stops like the Venetian. It can be tough to flag down Taxis during the new year at popular spots. It’s possible, but just be prepared to have to work for it. You might stand more chance if you’re a gwai lo (westerner), but we only ever use them as a last resort. There are companies you can call and prearrange taxis (and large ones – great if you have kids). My wife has always called to book these in Cantonese – so can’t give first hand experience of what it’s like to arrange. Not the cheapest option, but not unreasonable, and the service we had was always first rate. Not sure about the current legality of Uber. But it’s available and we’ve used it a few times and it can provide a great service, especially if you’re stuck or laden with bags. Definitely worth getting the app and registering in case you need it. Update: I recently discovered Uber is currentyly suspended in Macau – more details here. This is a shame for the consumer – as it had been really convenient in the past (especially Uber X with a child’s buggy). This may change again so probably worth checking the current situation before you go. As mentioned above – don’t forget Macau is pretty compact, and a lot of the popular sites are within easy walking distance. It’s worth checking the map to see if you can walk it if you are having difficulty getting a bus or taxi. 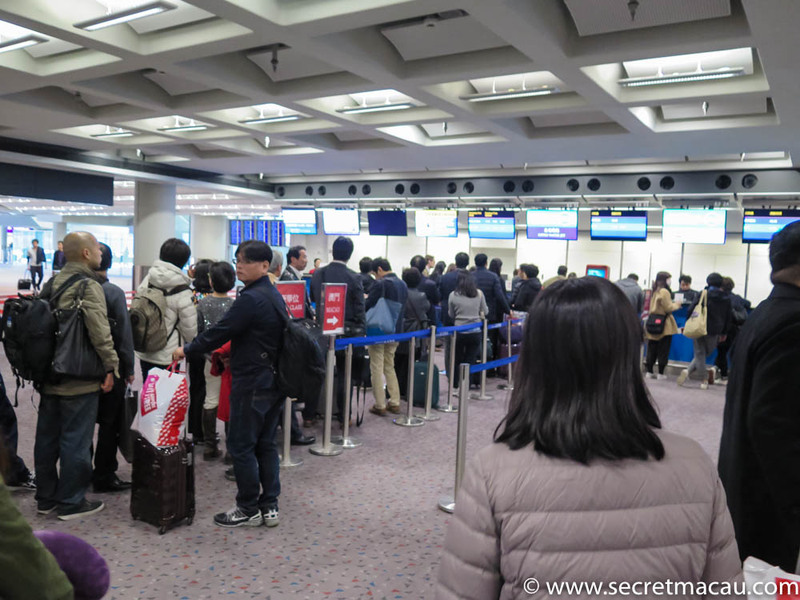 If you’re getting the Ferry from the SkyPier in HK airport my experience has been it’s not too busy at the Ferry desks. However, the Ferry’s themselves can be booked up, so be prepared that you may need to wait for a later Ferry if the next ones are fully booked. This may be an issue if it’s the last Ferry of the day. They may have spaces available on the Premium services though so it’s worth asking – find out more here. If you’re getting the Ferry from the Shun Tak centre – it’s a different kettle of fish. Be prepared to fight your way through masses of mainland tour groups, and allow time to pass through immigration to get to the ferry gates. If you want to join in with local customs – carry a few red pockets around with you to give out as gifts and tips. Red Pockets are just small red envelopes into which you can put some money (typically notes). You can easily buy packs of them cheaply at Chinese supermarkets (outside china), or at all kinds of places once you’re in Macau. The amount of money doesn’t have to be much – 10 or 20 Patacas (which is approximately £1 to £2). If someone is particularly helpful, or if you are returning to a good restaurant – giving a red pcoket will be greatly appreciated. You don’t need to of course, especially as a foreigner, but it would be a nice gesture if you think it’s worth it. Check the weather forecast before you go. Because it’s so warm for most of the year, a lot of places have no heating – and it’s very common to wear coats indoors. High humdity can make the low temperatures feel much worse. If you’re only there for the day, or staying in hotels it’s not so bad – but if you’re going for a few days and plannig on spending a lot of time outside – wrap up warm.